Our Real House Pet of Jasper County sponsored by Interstate Insurance Services, Ltd. Kato is a 2 year old American Bulldog who loves humans of all ages and other dogs, too! Kato is neutered and microchipped and ready to meet you! He’s very kind and very gentle and ready to meet his forever family! 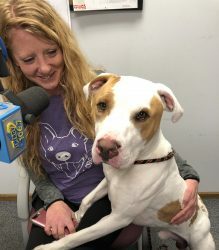 Because Thursday is National Pet Day, large breed dog adoptions are 1/2 price this week at the Jasper County Animal Rescue League and Humane Society. Support your local shelter!! !